The Flash spell looks quite simple; it's a Nova-burst that hits everything within melee range of the caster, dealing substantial Magic damage. That's what the spell description says, anyway. The actuality, as most players soon discover, is that Flash doesn't work very well, past Normal difficulty. There are three chief reasons why Flash falls short of its potential. Flash deals far less damage than the (very high) listed value. This is not due to a bug in the spell's function, but to incorrect listed damage. Flash deals magic damage, which is never essential in Diablo, since no monsters are Immune to Fire and Lightning, yet vulnerable to Magic. (Plenty of monsters are in Hellfire's Crypt level, and in that game magic damage becomes much more valuable.) Chain Lightning and Fireball are always better options than Flash in D1. Flash only hits targets immediately next to the character. This means Flash against melee monsters will result in the player getting pounded on, and Flash against ranged attackers will miss a lot, since the monsters will run away. There's no strategy to make Flash overcome all three of the problems. Compounding these three is a fourth that's definitely a bug. Flash deals very different damage depending on whhere the monsters are standing. Put simply, Flash only deals strong damage to 5 of the squares in range; it hits for far lower damage to the other three adjacent squares. 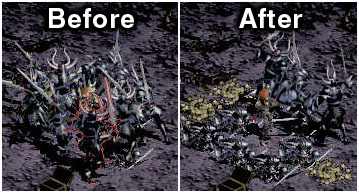 This image dramatically shows the three weak spots, with before and after photos. Each cast of Flash does much less damage to those three squares, a fact only discovered by players after extensive testing and experimentation. There is no way to fix this bug; there are only work-arounds. They're pretty obvious in this case; don't try to kill monsters with Flash if they're in any of those three squares. You will be displeased with the results. Flash can be used with the telekill technique, but there's a problem. The default location a character appears in after teleporting onto a target is one of the 3 spots that Flash is sub-optimal in. You must therefore teleport to a spot just above or to the left of the target, or else take a step to get to that location, before you start Flashing. This isn't a fatal flaw since Flash isn't a stun lock spell or a way to kill instantly, so it's not effective to use for telekilling targets anyway. But it pays to keep this location issue in mind. Characters appear in one of Flash's dead zones when performing a regulation Telekill. Thanks to Moriah's Teleflash page for the screenshots included on this page. This page was last edited on 3 October 2011, at 04:14.